For additional information about this book, visit the website Susan Goldfein. Essays that prove being over the hill just gives you a sharper view. The life examined is worth living especially if it’s this deep and funny. Written with wit, style, insight, and great good humor. 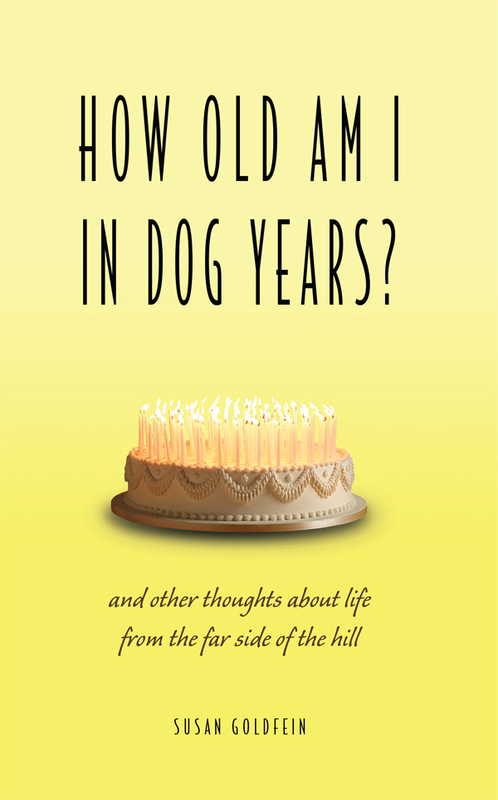 How Old am I in Dog Years? is a joyous, snark-filled, and completely relatable collection of essays that skewer the foibles of ordinary events. With topics ranging from marital “bliss” to wearing stiletto heels at an age when one should know better, Susan blends just the right amount of the absurd into her daily life to keep her readers laughing—and thinking. After all, where else can you find reality TV with a senior slant, or organic food shopping with a side of wry? This sparkling collection will appeal to mothers and daughters alike, as well as the fathers and sons trying to figure out what the other side really thinks. Susan Goldfein holds a doctorate in Communication Disorders from Teachers College, Columbia University, which, while affording her a successful career as a clinician, teacher, and consultant, has done absolutely nothing to prepare her for creating this book. Nevertheless, she has plunged into a second career writing humorous essays about life with wit, wisdom, and a touch of irony. Hailing originally from New York City, she currently lives in Florida with her husband and their two senior Yellow Labs, Bette and Davis.